Junk Silver Coins - What is "Junk" Silver, and Where Can You Buy It? Junk silver is a term used to describe silver coins that are in fair condition, with no numismatic or collectible value over the value of the silver it contains. Junk coins are called “junk” because they’re not considered rare or having significant collector value. However, they are still popular among people who want to invest in silver. 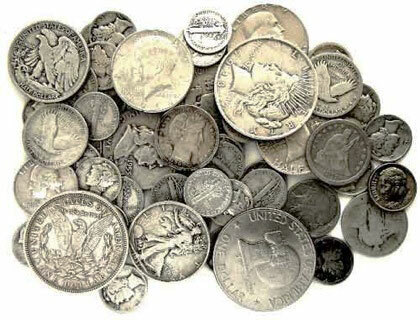 Silver coins collected as “junk silver” contain between 35 percent and 90 percent silver. U.S. coins containing 90% silver were generally minted before 1965, and contain 90% silver and 10% copper. After 1965, because of increasing precious metal costs the composition of U.S. coins was changed, primarily to copper and zinc. Examples of junk silver coinage include Liberty Head, Mercury, and Roosevelt dimes, Liberty Head, Standing Liberty, and Washington quarters, Liberty Head, Walking Liberty, Franklin, and Kennedy half dollars, and Morgan and Peace silver dollars. Any combination of 90% silver U.S. coins with a face value of one dollar (such as ten dimes or four quarters) generally contains 0.715 troy ounces of pure silver. In other words, a full troy ounce of silver is contained in any combination of 90% silver U.S. coins with a face value of $1.40. There are several notable exceptions to this rule: the Morgan and Peace silver dollars each contain .7736 troy ounces of silver. Three of the most common U.S. coins collected as junk silver are the Morgan dollar, the Peace dollar, and the Kennedy half dollar. While many of these coins have collectible value if they are in good enough condition, many coins from this era have too much wear from circulation. However, they are still collected for bullion value. Some U.S. silver coins may still be found in pocket change. In other cases, they may be purchased in bulk from coin dealers. The pricing of such coins moves up and down along with the spot price of silver, since the value of the coins is based on the bullion value of the silver. One of the benefits of buying junk silver is the small investment. You can add to your investment a single coin at a time, while buying bullion in bars or rounds requires a more sizable investment. Such coins can generally be purchased for little or no premium above the spot price of silver. The coins collected can easily be traded or spent in small amounts. In contrast, silver bullion is rarely available in sizes less than one troy ounce. This factor has made junk silver collecting popular among survivalists and others who are concerned about an economic catastrophe rendering our current coinage worthless. Modern U.S. currency is not backed by precious metals; it has no inherent value. Meanwhile, the presence of precious metals gives silver coins an inherent value. Unlike silver bullion rounds and bars, silver coins are still considered legal tender. In other words, a silver quarter will always be worth 25 cents, regardless of the current spot price of silver. If the price of silver were to decrease, the coin maintains its face value.